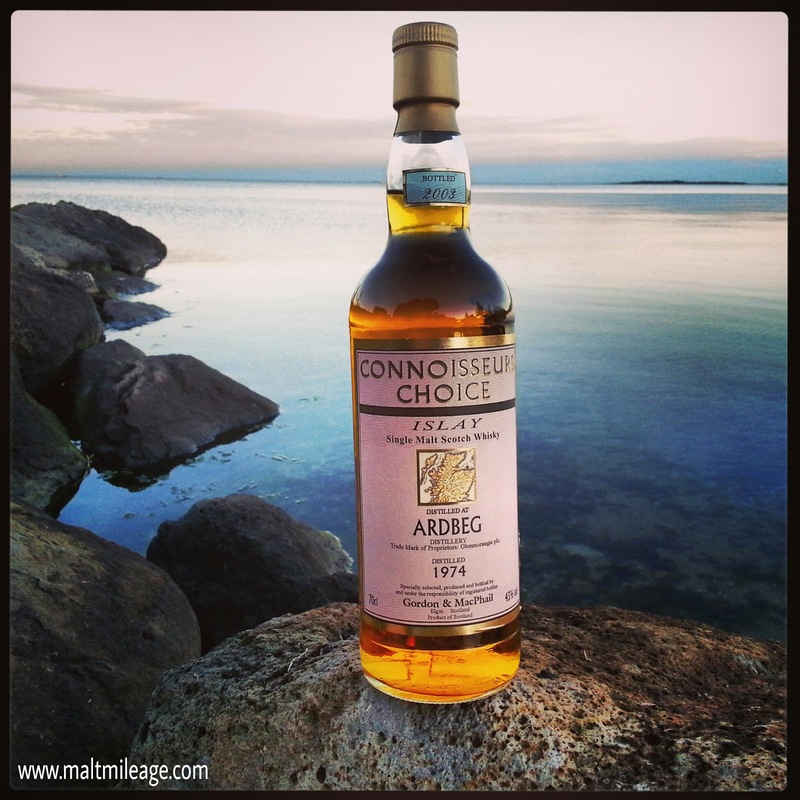 If you are new to the whisky world, you will quickly discover that Ardbeg is probably one of the few whisky distilleries with a cult following surpassed only in my view by the awe inspiring Port Ellen and Brora which closed their doors in 1983. You will understand my excitement, then, at securing an independent bottling of Ardbeg 1974 vintage. Aged for 29 years, this Ardbeg offers the famous Ardbeg peat with refined elegance and grace. After almost three decades in an oak cask, it is no surprise that the peat influence has mellowed as the oak worked its magic over almost three long decades. This beautiful Ardbeg is distinctly beach themed, and this matches my above picture which was taken on the rocks of Altona beach (Melbourne, Australia) at dusk. Nose: The complexity of this whisky is revealed once the aroma of a sunny afternoon by the beach leaps out of the glass. The smell of the cotton towels, plastic ice box and leather football sitting on the sand mingles with iodine and plasters as the bitumen swelling in the heat is faintly smelt in the distance together with some dry branches that have fallen off nearby trees and sit cooking in the sun. The wind from the sea blows gently with characteristic Islay peat, and a kick of the football flings up some wet sand. Only has the Highland Park 25 and 30 Year Old conjured such vivid memories. Taste: As expected the peat is mellow and light, but it has a density that withstands the oak driven onslaught and red citrus fruits that burst on the palate. The taste of the pier, with its wood and steel, mingles with earthy sand as a cloud of smoke bursts with beachside flavours. Finish: The mild peat remains with the bursts of red citrus fruits leaving the taste of pink grapefruit on the base of the tongue together with notes of seaweed and sweetness that is interrupted by the slam of that football as wet sand violently flings off hands which have made a great save! Well done keeper!! The complexity in this whisky is very unique and enjoyable, with a distinct theme that rekindles memories of soccer/football games by the beach. This is almost seamless with a density and presence in the glass that makes me finally understand why Ardbeg has earned it cult status. Beautifully mature and elegant, the mellowed peat and craftwork of the oak gods has produced a whisky with fine detail and subtle shades of brilliance. This whisky is very rare, which makes it even more pleasurable to savour and appreciate. Lucky me!! The mellow peat may disappoint some “peat heads”. Remember, peat mellows with age so do not expect the smack of peat you might get with young Islay whiskies. This whisky is not that kind of whisky, it is 29 years old so the oak gods have had lots of input and, luckily, this whisky is seriously distinct and complex in an enjoyable way that I think only whisky aficionados will enjoy.